VIZ Media Announces "Demon Slayer: Kimetsu No Yaiba"
TIN CAN MAN AND DEMONSLAYER JOIN ENTERPRISE ROSTER! The Taisho era Japan (1912 to 1926). Tanjiro Kamado, a kindhearted boy, sells coal in order to support his mother and four siblings. After one particularly taxing trip to sell coal, Tanjiro returns to his home in the forest and finds his family slaughtered. He discovers that a younger sibling, his sister Nezuko, has herself been transformed into a demon by the unknown demon that killed his family. He becomes a Demon Slayer to find and destroy that demon. Demon Slayer: Kimetsu No Yaiba, Vol. 4 (Chapters 26 to 34) opens in the wake of Tanjiro and company's battle inside a house full of demons. Now, Tanjiro finds himself fighting Inosuke Hashibira, a young man who wears a boar's head and who may be a Demon Slayer. Tanjiro sees him as an ally, but what an ally they will need him to be as they face demons that turn Demon Slayers into marionettes. Plus, Zenitsu Agatsuma, a demon slayer who seems to be a coward, discovers the existence of Nezuko. THE LOWDOWN: The Demon Slayer: Kimetsu No Yaiba manga was one of 2018's best new graphic novel series. It is still kickin' in the two-oh-one-nine. Demon Slayer: Kimetsu No Yaiba Graphic Novel 4 focuses on the characters outside of Tanjiro. Creator Koyoharu Gotouge has offered new intriguing characters, especially Zenitsu Agatsuma and Inosuke Hashibira, both with interesting pasts and both possessing personalities that clash with the sweet-natured Tanjiro. More characters are showing layers and textures in their personalities, an element that makes Demon Slayer a manga deserving to be read. 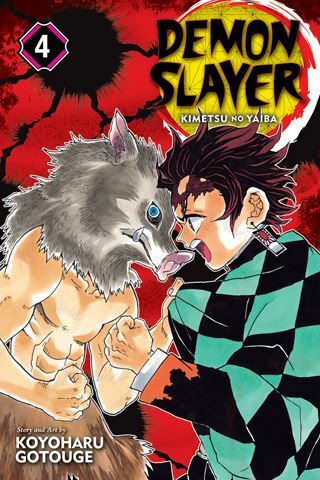 I READS YOU RECOMMENDS: Fans of demon-fighting heroes will want to read the Shonen Jump title, Demon Slayer: Kimetsu No Yaiba.